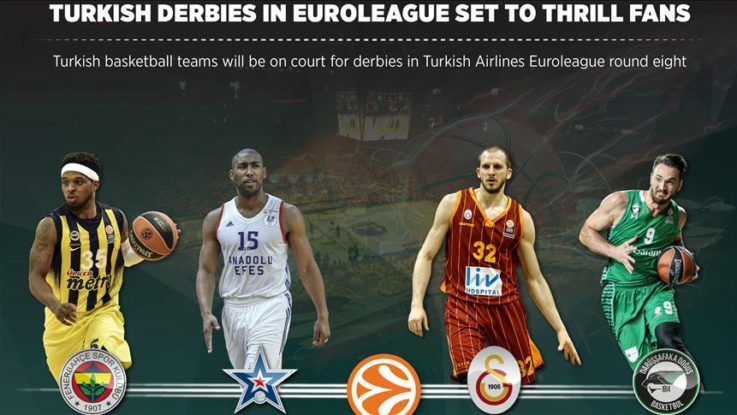 Europe’s biggest basketball club competition, the Turkish Airlines Euroleague, is set to once again see Turkish teams battle each other in round eight of the tournament. On Thursday, Istanbul powerhouse Fenerbahce will play against Anadolu Efes, and on Friday, Galatasaray Odeabank will host Darussafaka Dogus. The new Euroleague format allows all 16 teams to play against each other in a league format – a break from the old system, which divided the teams into two groups of eight. Turkish teams have invested a lot in basketball in the past several years and reaped the rewards. In Euroleague, there are four Turkish teams out of 16 battling for the crown. In the 2015-2016 season, Fenerbahce managed to qualify for the final but lost to Russia’s CSKA Moscow. The four teams also battled against each other in the fourth match day of the tournament, when Fenerbahce beat Galatasaray Odeabank and Anadolu Efes beat Darussafaka Dogus. In the last 21 years, Turkish basketball teams have met each other 45 times in various tournaments such as the Korac Cup, Europe League, European Cup and EuroChallenge. In those 21 years, Fenerbahce and Anadolu Efes met each other nine times, the most of any pair.